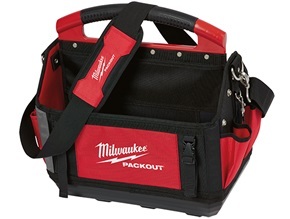 Milwaukee PACKOUT 15" Tote - Holmes Plbg and Htg Supply Co.
Part of the industry’s most versatile and most durable modular storage system, the Milwaukee PACKOUT™ 15 inch storage tote features an impact resistant molded base that fully integrates with all PACKOUT™ system components. Constructed with 1680D ballistic material and all metal hardware, the 15 inch storage tote is designed for ultimate durability while the included padded shoulder strap and durable over-molded handle allow for easy transport. The 15 inch tote features 31 total pockets designed to organize and carry power tools, hand tools and accessories.